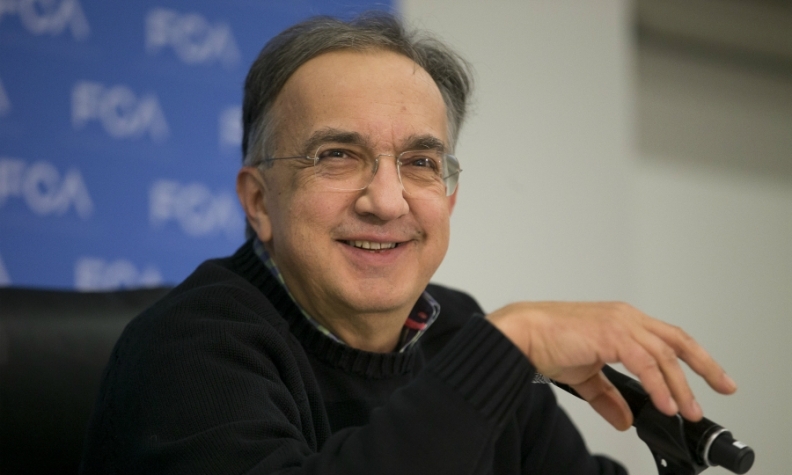 Marchionne: "I have no doubt that at the relevant time VW may show up and have a chat." GENEVA -- After PSA Group's move to form Europe's second-largest carmaker with the purchase of General Motors's Opel unit, the next step in a looming consolidation wave could be a bid by Volkswagen Group for Fiat Chrysler Automobiles, the Italian automaker’s CEO Sergio Marchionne said. "I have no doubt that at the relevant time VW may show up and have a chat" for a merger, Marchionne, who plans to retire as Fiat Chrysler CEO by 2019, said at the Geneva auto show on Tuesday. The PSA-Opel combination "threatens VW most, creating a No. 2 on its heels." Opel's planned sale to PSA, announced Monday, could spur more mergers as manufacturers confront a shift to self-driving, electric cars. PSA's bid to better compete with Volkswagen serves as a test case as CEO Carlos Tavares seeks to replicate his turnaround of the French carmaker at Opel. Successfully integrating the mass-market rivals could then prod others to follow. "The industry is moving towards consolidation," said Carlos Ghosn, CEO of Renault, who added Mitsubishi Motors to the French carmaker's alliance with Nissan Motor Co. last year. "You're going to see more and more players trying to gain in terms of scale. It's logical because of all the investments we need to face," he said in a Bloomberg TV interview at the show. Purchasing GM's Opel and its Vauxhall nameplate for 1.3 billion euros ($1.4 billion) gives PSA a broader network to spread costs for new vehicles. But the benefits will be slow to realize and follow more than a decade of restructuring that failed to end losses at the GM unit. The critical component for making the deal work is sharing investment underneath the hood while keeping the brands' identities unique. Teaming up with PSA "offers many opportunities" to share costs in areas including vehicle development and purchasing, said Opel Chief Karl-Thomas Neumann, who will stay on after the deal is completed. "We know we've got a lot of work ahead of us." PSA is prepared for other deals, including a bid for a stake in Malaysia's Proton Holdings, another money-losing carmaker that’s also the owner of UK sports car brand Lotus. If PSA manages to bring Opel to "an efficiency level that is equivalent to PSA's today, we will be in a very good position to deal with prospective opportunities that could arise," Tavares said. Meanwhile, Volkswagen, which is still recovering from its diesel emissions-cheating scandal, is dismissing any extra pressure from the PSA-Opel combination. The company has repeatedly shrugged off interest in major acquisitions as it restructures its namesake VW marque. "We focus on what we have to do to reach our strategic goals," Volkswagen CEO Matthias Mueller said in Geneva. For Fiat, Marchionne has long been a vocal proponent of consolidation, arguing that the industry wastes money by developing multiple versions of the same technology. Since GM rebuffed his idea for a merger two years ago, Marchionne has sought to eliminate debt at Fiat to make the carmaker a more attractive partner down the line. "The GM door was never open for me. I knocked and no one answered," said Marchionne. "Would I knock again? Why not, or at any other door."